Nirma University B.Tech Admission 2018 (निरमा विश्वविद्यालय बी.टेक प्रवेश): Nirma University is invited to undergraduate students for admission in four-year engineering courses. Interested candidates can apply online to by submitting the Nirma University Admissions Form 2018. Every year thousands of students apply application form and take admission. Applicants will be selected on the basis of JEE Main Score Card 2018. Nirma University is one of the best universities in all over India and provides education in engineering for many of branches. Students who want to take admission in Nirma University then first need to apply to Nirma University Engineering Admission 2018 (NUET). The students who are interested and eligible to get admission in Nirma University, they cna apply for the Nirma University Application Form. The forms will be made available soon. We will provide here the direct link through which you will be able to apply online for the form. The students just have to follow some precise procedure for performing the Nirma University Admission Apply Online process. Steps to submit the Online registrations. Visit the official website of Nirma University. Make an Online Registration by filling the personal details and create user Id and password. Make login to the website by entering the user Id and password that you created. See the application form link in notifications and click on it for the open application form. Start to fill the application form and fill it by correct info without any mistake. Upload the scan copy of academic documents, recent photograph, and signature in the application form. Upload JEE Main Exam scorecard. Recheck the filled form and click on submit button. Take a printout copy of application form. Nirma University application fee must pay students who want to apply online and take admission in Nirma University. Students need to pay Rs. 1200/- (one thousand two hundred rupees only) to the online application form for only all-India category students. Students should have to pay Rs. 350/- (three hundred fifty rupees only) non-refundable for the school located in the state of Gujarat or Union Territories of Daman and Diu or Dadra Nagar Haveli. Candidate can pay application by using mode of online (credit card/ debit card/ net banking). Students can easily choose one of the following methods to pay the online application fee. Nirma University Eligible Criteria to students given below and aspirants must be full fill in all term and condition which is given below. Candidates can simply follow these simple conditions. Students should be passed in previous three-year diploma course and can apply to second-year engineering course. Aspirants should be passed in 12th class or higher secondary class standard with minimum 50% aggregate. Candidates should be passed in 12th class with subjects Physics, Chemistry, and Mathematics. JEE Mains (Joint Entrance Examination) qualified candidates also can apply for Nirma University. Nirma University Course Offered for only those students who have applied for Nirma University Entrance Test. Nirma University offered a course for undergraduate students in many branches which are given down. Candidates can select easily one stream to do four year degree course program. Nirma University seats available for those candidates who want to take admission in University. Candidates can visit Nirma University seat allotment format and apply for admission according to via seats available format. Nirma University Selection Process is the way to admission in Nirma University. Students who apply for admission then they will pass in given below steps. Admission Committee for Professional Courses (ACPC) decides to 50% of the seats. 35% of the seats are open for all India students who passed the qualifying examination. Students will be select by a scorecard of Joint Entrance Examination (JEE) Mains. Candidates will be select on the performance of 12th class standard or higher secondary class standard. Candidates will be shortlisted for admission in Nirma University by counseling process based on Joint Entrance Examination (JEE Mains) score card or 12th class standard. Students need to apply for counseling process and shortlist students will be informed through their registration valid Email ID and mobile no. Shortlist candidates required to verification their original documents on the notification date. Candidates who can’t attend on counseling process must be terminating for admission. If the Aspirants are unable to attend on scheduled date and time, admission will be canceled. Students, Firstly have to apply for admission and registered for counseling process, then Nirma University announces for students who are shortlisted for admission. 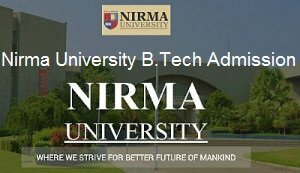 Students can visit easily and see their Nirma University B.Tech Admission Result 2018 on the official website. Students need to mention their name, registration, and any required entries to check result. Nirma University Admission 2018 is available now for engineering first-year undergraduate course program. Nirma University Admission takes admission on basis of higher secondary or 12th class standard. So Students who passed in 12th class and want admission in Nirma University (NU) can simply apply online. For more details concerning the Nirma University BE Admission 2018, you are advised to either follow the direct link given above or you may contact us by commenting at the end of the post, we will respond you as soon as possible.